Well-meaning, well-acted and well-directed, Steven Spielberg’s (Lincoln, Schindler’s List, War Horse) tale of freedom of the press and the legendary Pentagon Papers comes off as a film of tremendous ambitions and good intentions that falls short of classic status. Perhaps it’s Spielberg faltering at juggling too many elements and characters around and trying to make analogies to contemporary Fourth Estate issues that the film winds up feeling mechanical and even TV movie-like at times. Of course, in The Post’s spotlight is Meryl Streep (Into the Woods) as Katherine Graham, the publisher and owner of the Washington Post whose newspaper is about to go public in 1971. Graham’s feisty editor Ben Bradlee (Tom Hanks, Saving Mr. Banks) discovers that The New York Times is about to print “The Pentagon Papers,” thousands of pages of government secrets about the Vietnam War uncovered by ex-Marine analyst Daniel Ellsberg (Matthew Rhys, TV’s The Americans). After the Times receives a federal court injunction blocking it from making the material public, Graham must decide if it’s worth it for the Post, at a crucial time in its history, to publish the papers for the public’s good, risking a possible financial failure in the process. There’s inherent drama in the situation, but there are also legions of characters to be introduced and “freedom of the press” speeches to get to first, which seem to derail the thrust of a potentially dynamic story. All of this mutes the film’s power, turning The Post into a somewhat labored conception as opposed to the sharp and suspenseful successes on the par of All the President’s Men and Spotlight. While those two are at the top of the heap in terms of journalism movies, The Post doesn’t really come close to equaling their dramatic impact, never capturing the sense that real journalism is being depicted on-screen. Acting-wise, The Post offers Streep in another fine turn, playing wealthy new corporation doyenne who got the newspaper from an inheritance and is forced into make tough decisions. The myriad of top-notch supporting players backing her are solid with Bob Odenkirk standing out as Bob Bagdkian, the reporter whose contacts gets the Post the Pentagon Papers. Also in the background are the likes of Tracy Letts (Indignation), Bradley Whitford (TV’s Happyish), Bruce Greenwood (Gold) and Alison Brie (The Disaster Artist) chipping in nice bits throughout. However, Hanks’ portrait Ben Bradlee is no match for Jason Robards’ knock-out Oscar-winning work as editor Bradlee from All the President’s Men. 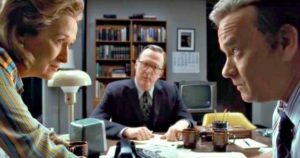 Here Hanks strikes some false notes both with his curmudgeonly mannerisms and “Bahston”-accented speech, drawing attention to the actor’s deficiencies in this all-important role. Certainly, The Post has something to offer in these troubled times where journalism—or what passes for it– is taken to task on a daily basis. 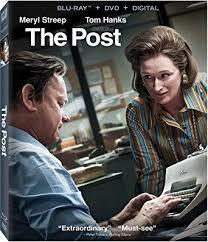 The Post brought in $80 million, found spots on several year-end “Best” lists and received Oscar nominations for Streep and Best Picture. All of these factors will work in the titles favor by winning a strong theatrical afterlife. You can print it! Irv Slifkin has been reviewing movies since before he got kicked off of his high school radio station for panning The Towering Inferno in 1974. He has written the books VideoHound’s Groovy Movies: Far-Out Films of the Psychedelic Era and Filmadelphia: A Celebration of a City’s Movies, and has contributed film reportage and reviews to such outlets as Entertainment Weekly, The Hollywood Reporter, Video Business magazine and National Public Radio. Agree, the film falls short. Maybe because they rushed it into and through production.